To provide culturally appropriate services and supports, it is important to understand the whole person and step into another person’s worldview to understand their perspective on life and on disability. Recently I attended a wonderful training delivered by Just Communities, a California nonprofit dedicated to social justice, that explored cultural proficiency and person-centered practices. We looked at the role of culture and identity in shaping values and beliefs about disability and support. Here are some of the highlights I came away with. The United States tops the continuum of individualistic countries, followed by the United Kingdom, Australia, the Netherlands, Canada and New Zealand. Countries that are more collectivistic include, among others, Mexico and other South American Countries. This is an important consideration as the changing demographics in California reflect a growing population from countries of origin that prefer collectivism. Listening to understand the dimensions of culture that make up our increasingly diverse communities can help us learn how to support one another well and design new service models to be more culturally appropriate. So where do we start? How do we begin to understand the myriad of factors that make up one’s culture? Culture extends beyond race and ethnicity. Cultural groups may be but are not necessarily limited by the following: race, ethnicity, age, language, gender, sexual orientation, political affiliation, religious beliefs, spiritual beliefs, regional affiliation, ability/disability, socio-economic status, professional affiliation, or any other characteristic that marks group affiliation. All individuals are cultural beings and have a cultural, ethnic, and racial heritage, as well as other identities. Culture encompasses a way of living based on the historical, economic, ecological, and political forces of a group. Culture is fluid and dynamic, it’s always changing. And culture exists at the individual, group, organizational, and societal levels. And with every good intention, sometimes we get stuck in one dimension of diversity, the disability culture – finding it hard to see beyond someone’s disability and recognize all the different parts that make up their identity. 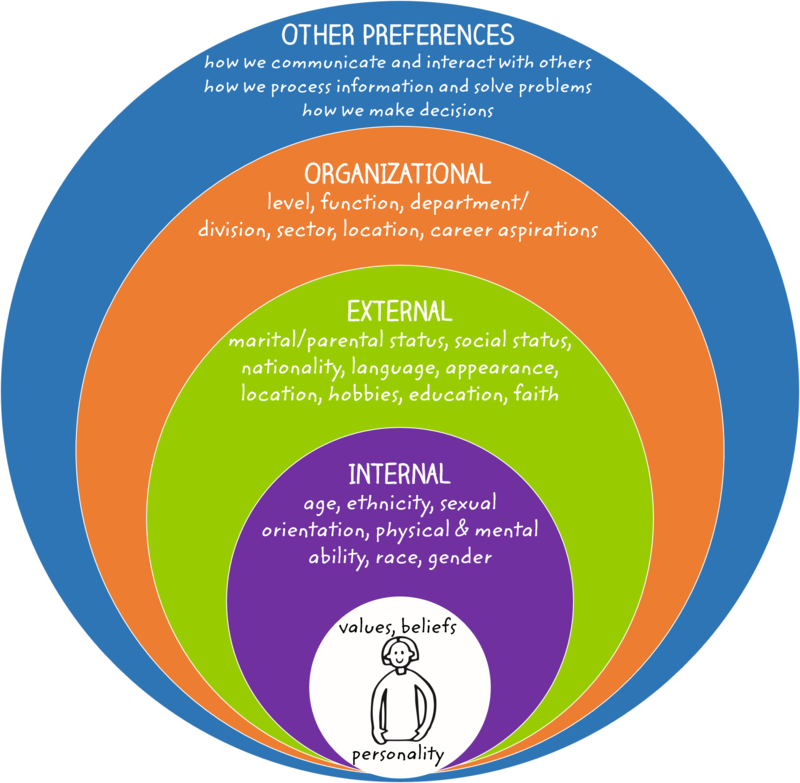 Dimensions of Diversity, adapted from work of Gardenschwartz and Irwin, is a reminder of the many layers of diversity that make up someone’s identity. This can be a great tool as we are getting to know the whole person and helping them to connect to what matters most to them. After thinking about the many dimensions of diversity it can be helpful to create a Multiple Identities Chart to provide an overview of the many roles we have, the significance of our heritage and traditions, the places where we feel a sense of belonging, and activities that help define who we are and what matters most. This exercise can help you and your team think about the impact of cultural identities on our daily lives and on how we support one another. My identity chart reflects the roles that I perceive as being valued by society. It also acknowledges where I have felt marginalized. At different times in my life, I’ve experienced prejudice or bias because of being female, for my choice of religious belief, for singing master choral works, which for many is very “uncool.” The newest area of bias for me is experiencing agism. Some parts of my identity I’ve chosen not to include on my Multiple Identity Chart – some are valued by society, others are not. And, in purple, I’ve noted that my political values of liberalism, coupled with fiscal conservatism are sometimes at odds and can cause conflict. 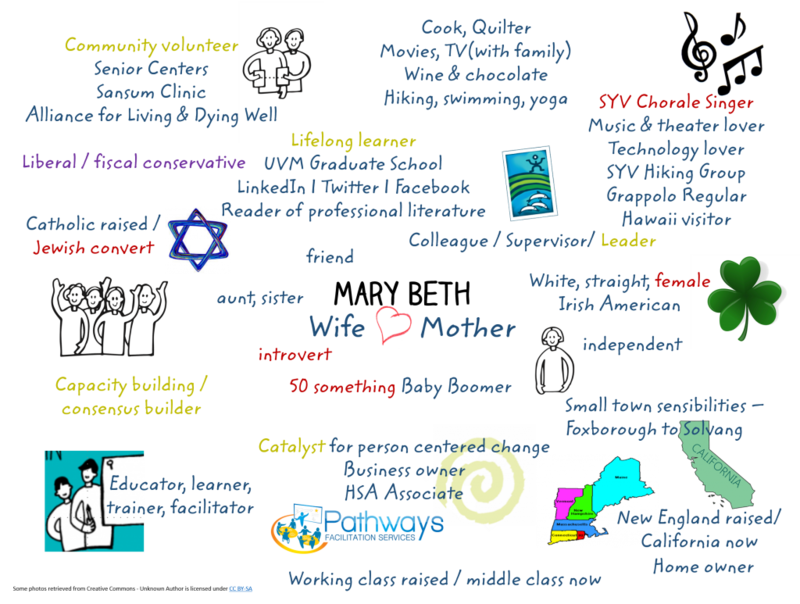 To ensure good support, I can use my Multiple Identity Chart as a resource to hire staff, looking for support providers who share similar values and interests. I can use it to introduce myself to staff and co-workers and as a foundation for building my one-page profile. I can also use it to explore new and different ways to connect to or remain connected to things that matter to me in my community. Try creating your own Multiple Identity Chart with these steps. Think about all the different parts of your identity, all the groups you belong to, all the roles you have, all of the various cultures you represent. Map out your identities on the page with those identities that feel most important to you – most central to who you are – closer to your name and those that feel less so farther away. Only place identities on the map that you are willing to share with others in the group. Use green ink for those items that are valued by society; use red ink for items that you feel are not valued, or for which you have felt marginalized; use purple ink for elements of your identity that seem to be in conflict. Thinking about the different parts that make up a person’s identity is helpful for starting a meaningful conversation to get to know the person well. The Multiple Identities Chart can help to match support, finding common values, roles and interests. It can also be a great way to begin community mapping. Use the Multiple Identities Chart to think of places where a person’s identities and cultural preferences will be welcomed and valued. This can help the person connect to what is important to them and help you know how to best connect with the person you are supporting in a way that is culturally respectful and appropriate. Thanks for reading! Next time, I’ll share some suggested questions for support planners and service coordinators to create space for diverse cultures to emerge and be honored in a supporting relationship.